Greek food takes center stage aboard the Muhtesem A Turkish gulet. 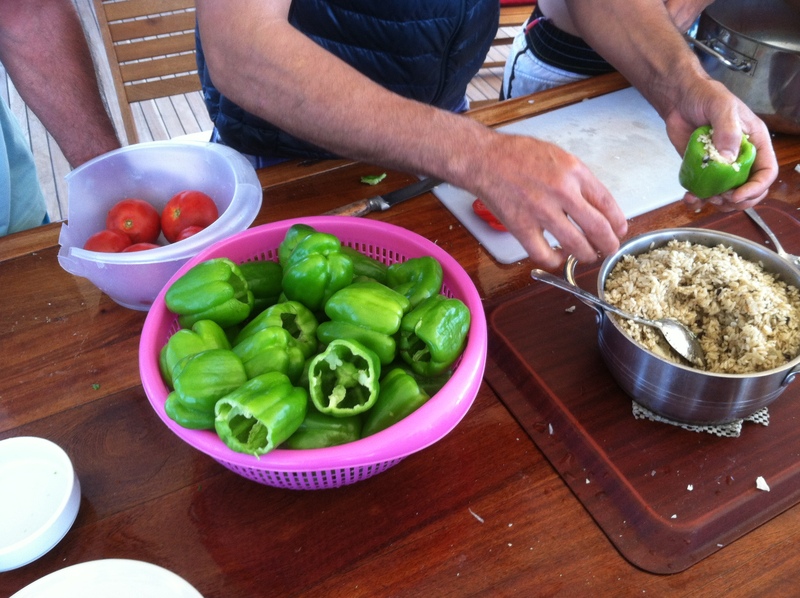 One of the best aspects of my recent journey with Mediterranean Delights Fitness Voyage was the incredible food prepared by Aytekin Karayigit, owner and captain of the Muhtesem A (the Turkish gulet that served as my home for eight days and seven nights). In addition to helming yachts throughout Italy, Turkey and Greece, Karayigit graduated from a cooking academy and has worked in the kitchens of five-star hotels. He brings a bevy of talent to the vessel. So much so, that I couldn’t help but look forward to each day’s meals. Here is a sampling of his fantastic recipes. In a bowl, mix uncooked rice, chopped parsley, chopped onion, black pepper, cumin, salt, mint, sunflower oil, tomato paste and uncooked ground beef. Stuff in a hollowed pepper, and cover with a tomato slice. Keep upright in a pan, filled with 3 glasses of water (or until peppers are covered). After water is boiling, simmer for 30 mins, until water is evaporated and rice is soft. Makes two per person. Chop 2 cucumbers, 1 tablespoon of mint and 3 pieces of garlic together. Add 2 tablespoons of olive oil and 1 teaspoon of salt. Mix well. Add to half a kilo of yogurt and mix again. Captain and chef Karayigit demonstrates how to make dolma. 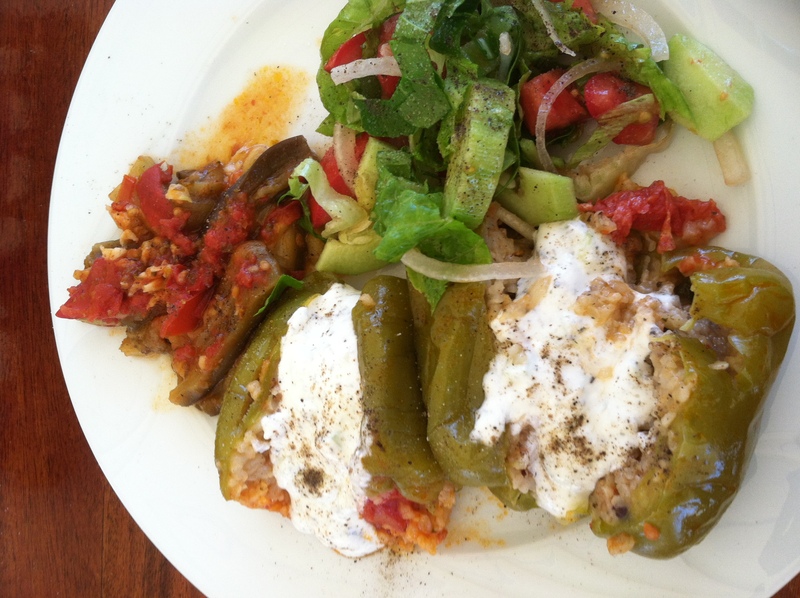 The finished dolma with cucumber yogurt topping. Remove the skin of the beans and break into 3 to 4 pieces. Add 2 chopped onions and 5 tomatoes. Add olive oil and salt. Sautee for an hour. Add a tablespoon of tomato paste. Add 5 glasses of water after the bean water is evaporated. Add 4 sugar cubes. Simmer until water is evaporated. Chop zucchini, eggplant, carrot, red pepper and green pepper in small pieces, and fry in sunflower oil. Add tomato. Add butter. Add a cup of bulgur and 2 cups of water. Add salt. Stir and simmer until the water is evaporated. 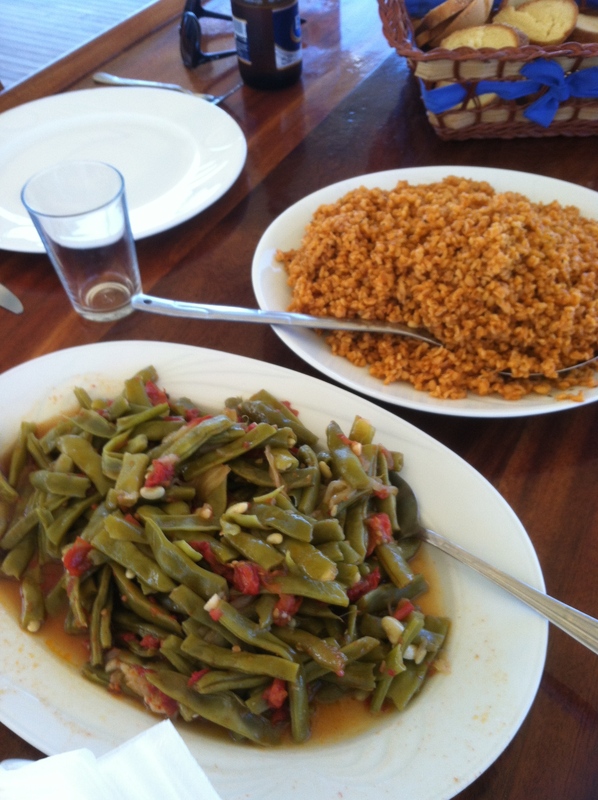 The finished Fasulye (green beans) and bulgur. Heat oven to 250 degrees. Brush a pan with sunflower oil. Place a layer of phylo dough on the pan. Cover with feta cheese, parsley and spinach. Add another layer of dough. Repeat twice. Add a top layer of dough. Brush surface with oil and one beaten egg. Put in oven, reduce temperature to 200 degrees and bake for 30 minutes. 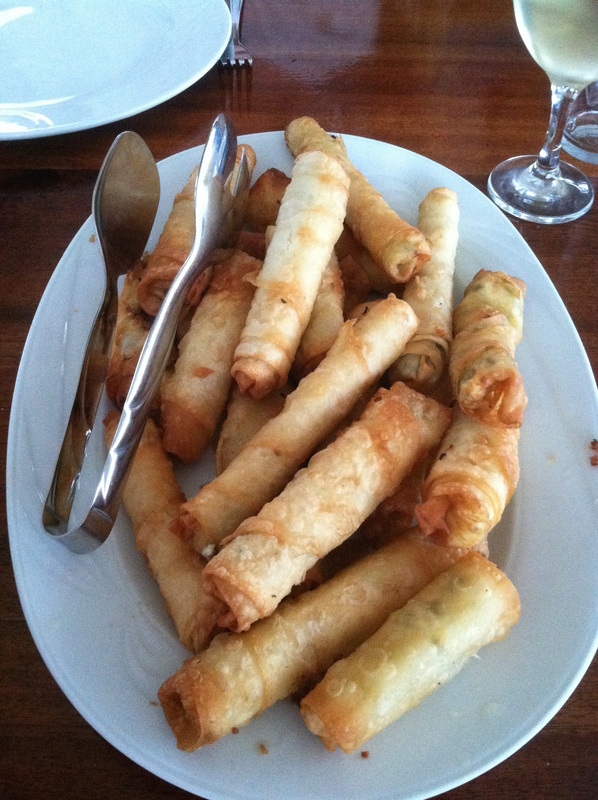 We altered this recipe a bit and made spring rolls instead of a casserole. 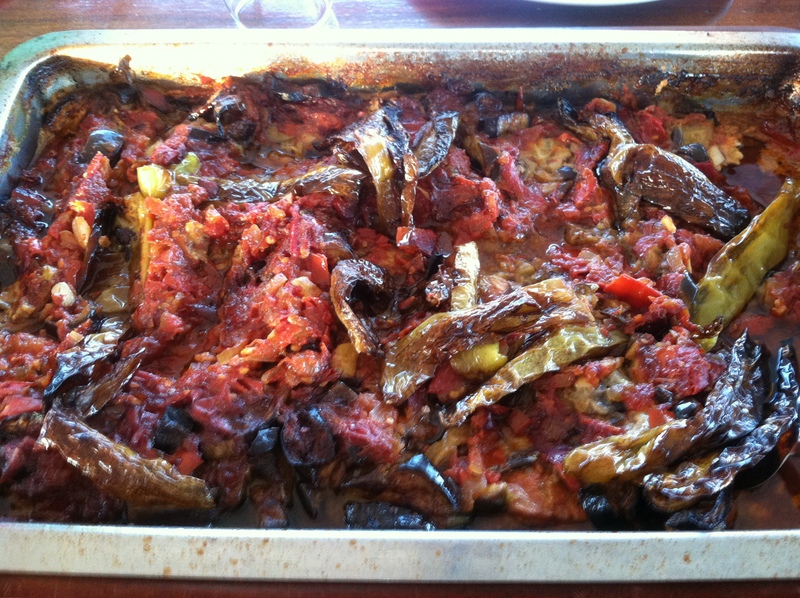 Cube one kilogram of eggplant, and put them in salty, cold water. Heat 5 glasses of oil in a deep pan, and fry the eggplant. Cook 5 sliced tomatoes and some garlic in another pan, then add fried eggplants over tomatoes and garlic and cook them together for about 5 minutes. Add 3 cubes of sugar, take off the heat and leave it to wait. Boil 4 big potatoes. After they cool, cut them in cubes. Chop 5 pieces of parsley and an onion. Add olive oil and lemon juice. 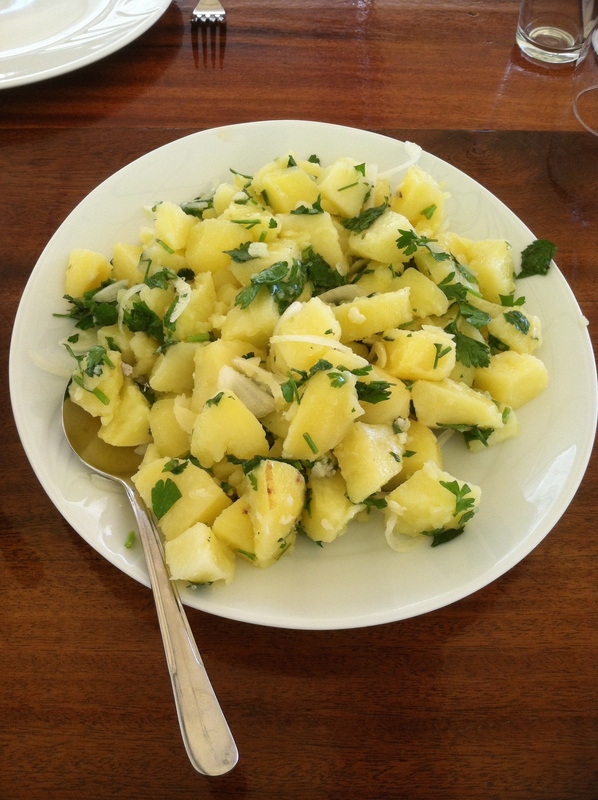 The finished Potates Salatasi (potato salad). And every day around 2 p.m., we had tea time with either tea or coffee, served with little shortbread cookies. 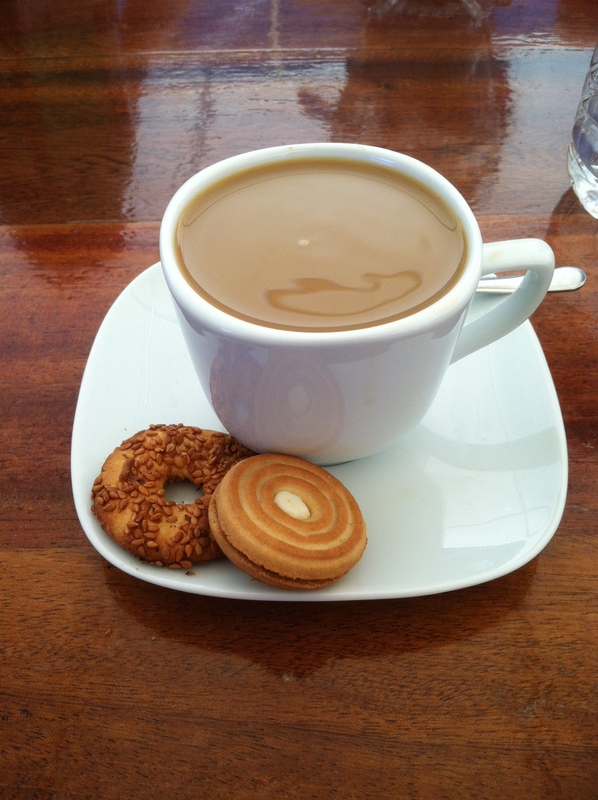 Afternoon tea (in this case, coffee) with shortbread cookies.